With a fantastic combination of thrilling parasailing and adrenaline pumping jet skiing, your Hawaiian holiday will be filled with excitement and adventure! The incredible captain and crew will take you off the coast of Waikiki on a world-class speed boat, and then strap you in for the flight of your life hundreds of feet in the air. If that wasn't enough, once you return, you will head out on a 20-minute boat ride to Sand Island where you will have 30 minutes to enjoy jet skiing on in the calm waters of the aqua track! Enjoy a birds-eye panoramic view of Honolulu! The X-treme parasail includes a line length of up to 1000 feet (305 m), an altitude of 500 feet (152 m) with a duration of 12-14 minutes. The Jet Ski portion includes two people, one driver and one rider. For those of you who want to ride the waves solo, this option is for you! Those who are not interested in parasailing but would like to accompany friends or family may book the Observer option. You may not have more Observers than Parasailers when booking your reservation. X-Treme Parasail is great for groups! The deluxe parasail includes a line length of up to 850 feet (259 m), an altitude of 425 feet (130 m) with a duration of 10-12 minutes.The Jet Ski portion includes two people, one driver and one rider. Open the throttle and feel the freedom and power! The standard parasail includes a line length of up to 700 feet, an altitude of 350 feet (107 m) with a duration of 5-7 minutes. The Jet Ski portion includes two people, one driver and one rider. Two thrilling adventures for one low price! Beginner Parasail includes a line length of up to 500 feet (152 m), with a duration of 5 minutes. Includes a boat ride to and from the course as well as a 15 minute tutorial and a full 30 minutes of ride time. Includes a boat ride to and from the course as well as 5 to 7 minutes of airtime. 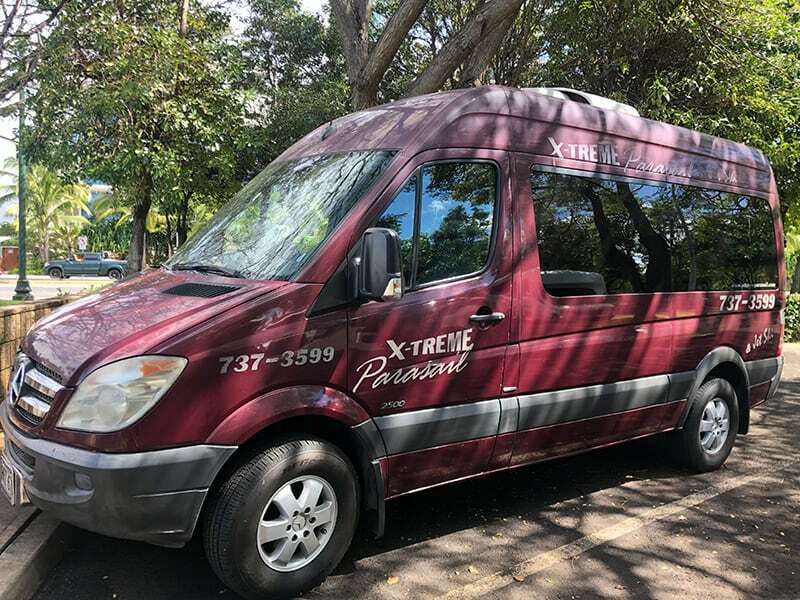 White, Red or Blue Sprinter Van with X-Treme Parasail logo. You must be at least 7 years old to ride on the back of a Jet Ski and at least 16 years old with valid ID to drive a Jet Ski. Minors (under 18) cannot drive with another minor. Maximum combined weight for parasailing is 525 lbs (238 kg) and maximum combined weight for tandem jet ski is 400 lbs (181 kg). waiver before minor participates in any activity. If you are driving on your own, you will be required to pay the parking fee. Parking is available around Kewalo Basin for $0.50 per half hour and must be paid in advance at the white pay boxes located in the parking lot. Rates are subject to change without notice. The altitudes and durations of the parasail rides are approximate and subject to change depending on the wind/weather condition and the weight of the passengers. All Jet Ski rides are 30 minutes in length. For guests who only want transportation but do not wish to observe, there will be a round-trip transportation charge of $5 per person. Payment is collected upon check-in and is subject to availability. Please advise of additional riders upon booking. The duration of this combo is approximately 3 hours. Please include an additional hour if you are using shuttle transportation from Waikiki hotels. The maximum group size for parasailing is 12 people, and up to 6 people may solo jet ski at one time. Storage is located underneath the seats of the parasailing boat. For your convenience, a glove box is located under the seat of the jet skiis but it is not a good place to leave cell phones and other small electronic devices.